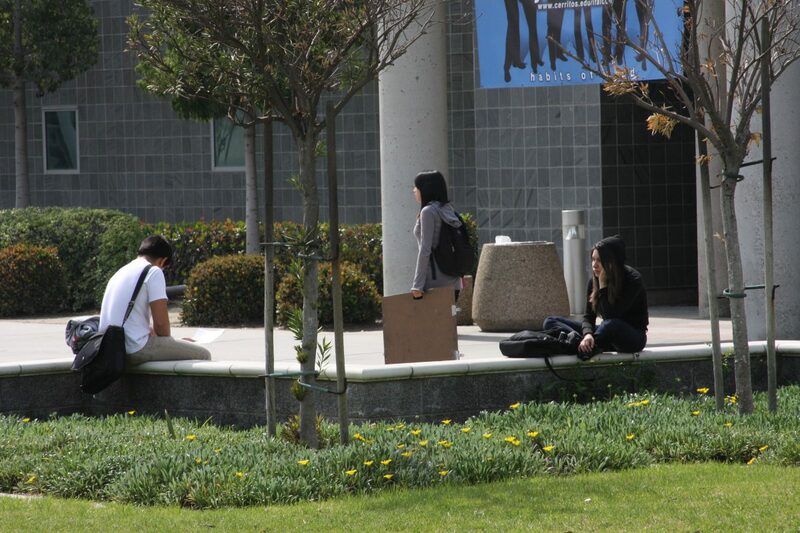 The Business Administration Department at Cerritos College began turning to open educational resources because faculty members saw many students struggling when they could not afford to buy expensive textbooks. 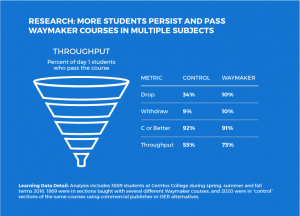 After OER led to demonstrable improvement in retention rates, the department partnered with Lumen Learning to shift the entire curriculum to OER, including department-wide use of Waymaker courses that provide personalized coaching and encouragement to help students become better learners. By fall 2016, the Business Department’s retention rate had climbed to 87%, up from 67% before it first introduced OER. In 2008, the Business Administration Department at Cerritos College was grappling with lackluster retention rates of just 67%. As a Hispanic-serving community college located in Los Angeles County, CA, Cerritos College educates students from diverse backgrounds and varying degrees of college preparation. With the climbing cost of textbooks in their Business and Management programs, fewer students were buying books, and their academic performance suffered. When the instructors learned about open educational resources (OER), they were determined to try open content. OER promised to help the department tackle problems with textbook affordability and access. Participating in the Lumen-led Kaleidoscope Open Course Initiative, the departmental colleagues began to redesign curriculum using OER mapped to learning outcomes developed in conjunction with industry groups. Every student had access to low- or no-cost materials from the first day of class. It wasn’t long before the Business Administration Department’s shift to using OER in selected classes began to manifest itself. Program passing and retention rates began to climb. The cost of course materials dropped. Students and workforce partners were delighted by the tens of thousands of dollars in textbook cost savings every term. The faculty team saw even more possibilities: shifting the entire business curriculum to open content. They turned to Lumen Learning to provide reliable access to the best available OER course materials. Lumen’s well-designed content, LMS-friendly technology and faculty support simplified the transition to OER. By spring 2016, the Cerritos College Business Administration Department’s retention rate was hovering around 87%-89%, an increase of approximately 20 percentage points. 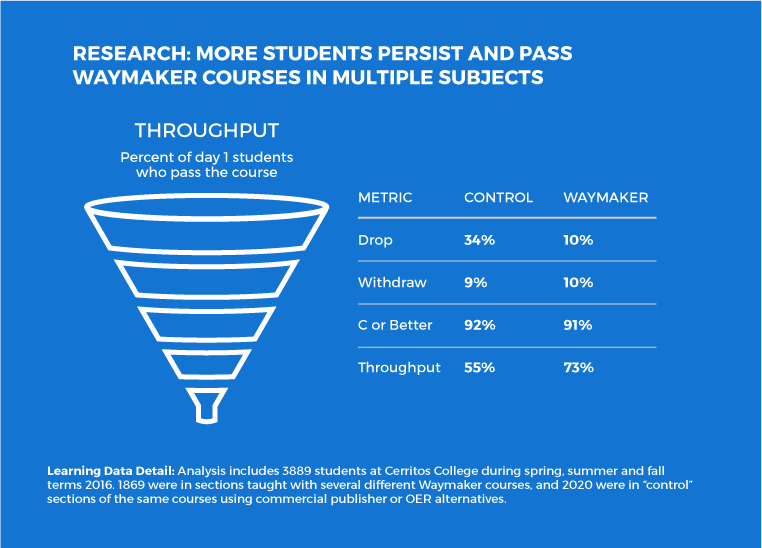 Using Waymaker OER course materials, the department saw more students staying enrolled and passing their courses successfully.